Let me start by warning you that when the cover says savage new world, you can take that literally. It is a really cruel depiction of Victorian England, or what Mr. Newman imagines it would look like if Vlad Tepes/Count Dracula made Queen Victoria a vampire and married her. I shudder just thinking about it. That said, the book is actually fun to read. 🙂 It’s not funny though. 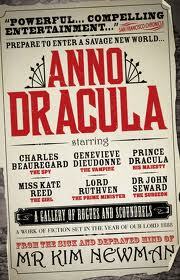 It’s cruel and depicts a dictatorial system where vampires are taking more and more power unto themselves (in England). There is a whole bunch of famous people appearing or being mentioned in the novel, some who were real, some who are only famous through their own books (like the Holmes brothers, Jack the Ripper, Van Helsing and so on). This Dracula is the one from the Bram Stoker’s novel, only this time there is no novel and Bram Stoker is gone with the Dracula in power – this Dracula has no romantic connotations we might imagine from the original story, all bets are off in this world, and you better relocate to some other country if you want to live your life to old age. We follow the story of several political (and criminal) factions trying to discover who is killing the vampire whores (Silver Knife renamed by newspapers into Jack the Ripper). That is how we meet both Genevieve (the vampire) and Charles Beauregard (human) trying to discover who that person is. You, as the reader, follow several characters’ minds and know quite early on who is the killer, but that doesn’t detract from the story. I must say I didn’t see the ending happening in the way it did, but it was good. I have no idea how this series flew under my vampire books radar for so long but I’m glad I know of them now and the next one is already on my TBR pile.